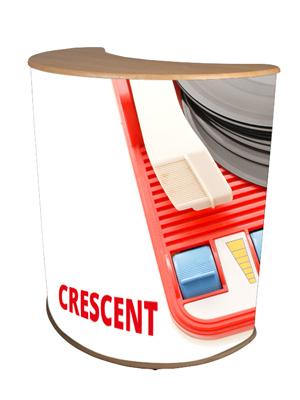 Crescent is part of the Physique Freestyle flat-pack counter range and is ideal as a greeting counter, workstation or product display unit. 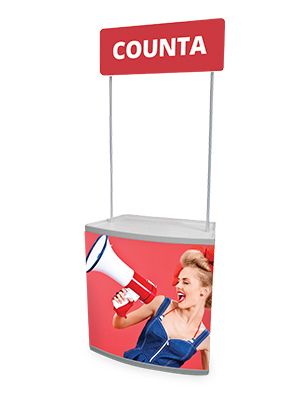 Lecturn is stylish and portable unit part of the Physique Graphic flat-pack counter range; ideal for roadshows and portable presentations. 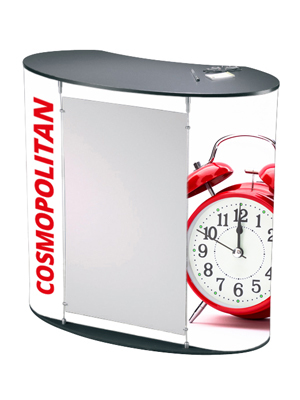 Cosmopolitan is part of the Physique Freestyle and Graphic flat-pack counter ranges. 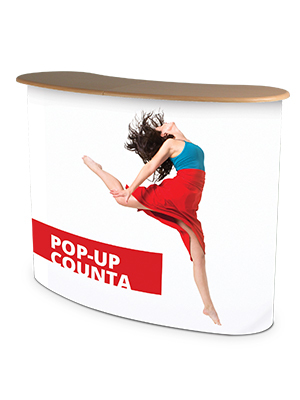 This is a versatile curved counter is supplied complete with a wire kit to suspend rigid graphics. 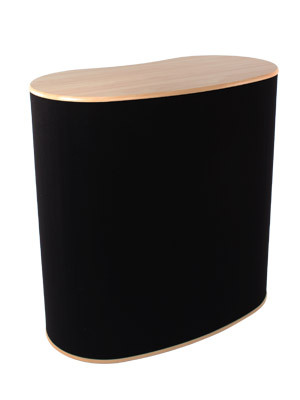 Urban is part of the Physique Freestyle flat-pack counter range. 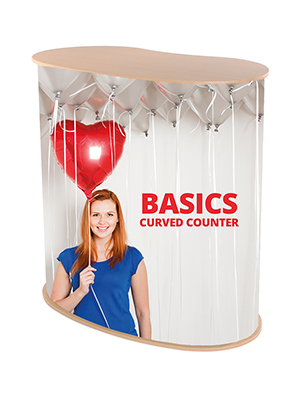 This is a simple, yet versatile curved counter is supplied complete with a handy acrylic counter shelf. 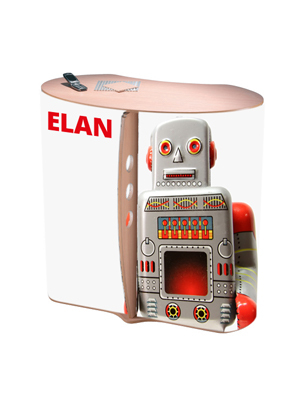 Elan is part of the Physique Freestyle and Graphic flat-pack counter ranges. 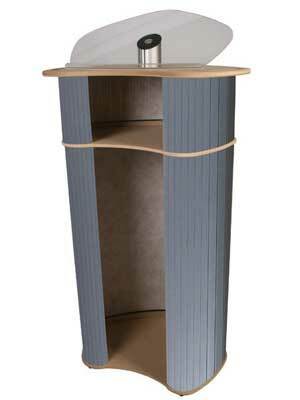 This is a versatile curved counter has distinctive styling. 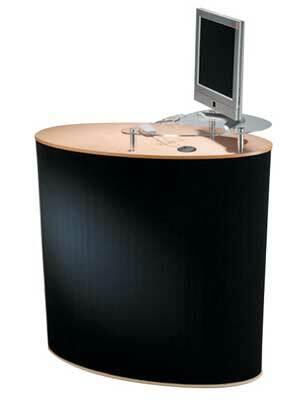 Data Pod is part of the Physique Freestyle flat-pack counter range. 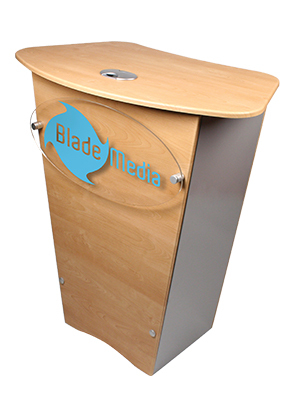 This is a simple, pod designed to secure an LCD screen; ideal as an information or demonstration point. 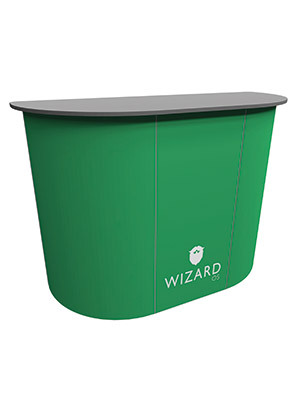 A range of four exciting designs that are strong, durable, high specification counter units specially created to complement the latest stand designs. 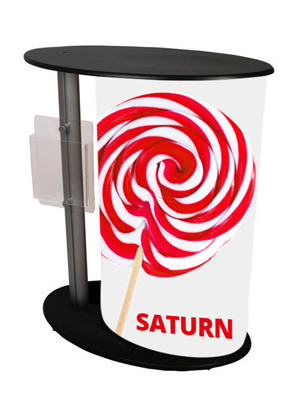 Saturn is part of the Physique Freestyle flat-pack counter range. 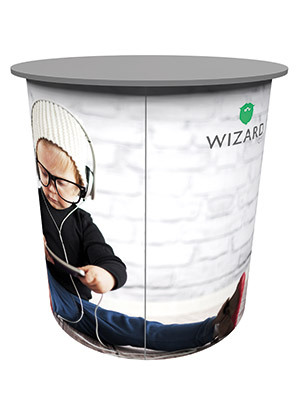 This ellipse shaped counter is supplied complete with integral A4 literature holder, making it ideal as a greeting counter, workstation or product display unit. 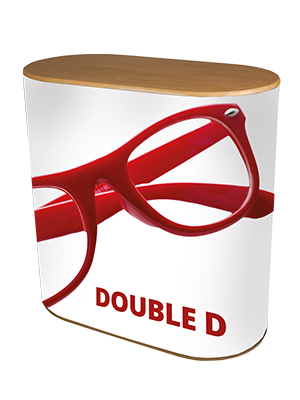 Large ‘double D’ shaped counter with curved front edge, available in MDF Freestyle or Physique Pole graphic styles. 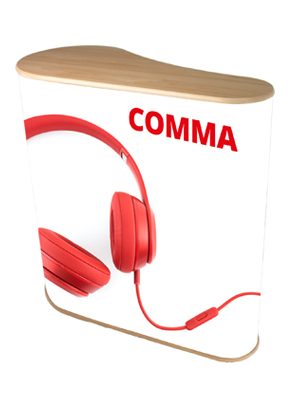 Strong and sturdy teardrop shaped counter available in MDF Freestyle. The unique propeller shaped frame and oval tabletop makes it an ideal gathering point that will appeal to guests to your stand. 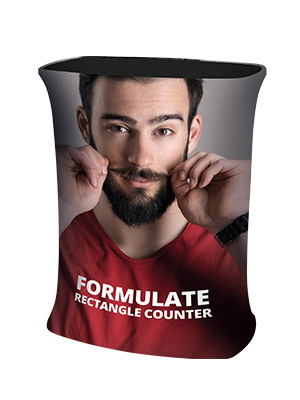 The C2 counter benefits from 360° curved graphics. 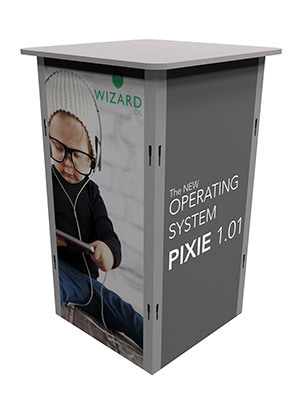 Select a tabletop to compliment the artwork and create a custom counter that will look at home in any retail space. 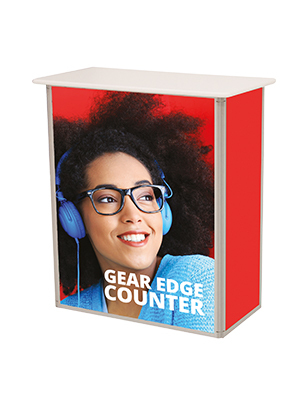 olid and sturdy, the lightweight Vector Lite C3 Counter enables the maximum graphic area for the smallest footprint that makes the C3 Counter ideal when a big impact has to be made in a small space. 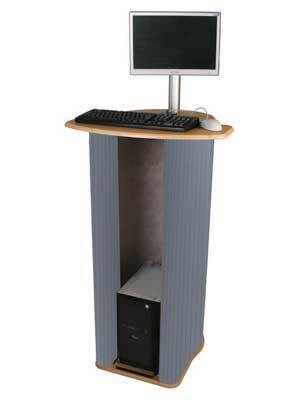 The C4 Counter is lightweight, versatile and can be used in many locations. 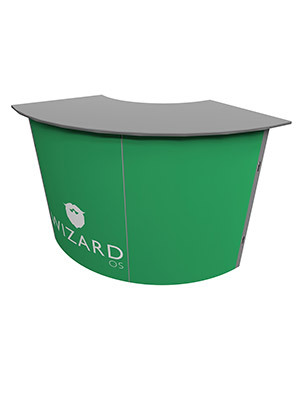 Use as a counter in an exhibition stand or as a plinth in a retail space. 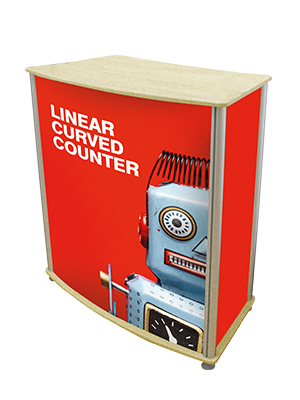 The Vector Lite C5 Counter is a quarter wedge shaped counter that is ideally suited to being situated in the corner of exhibition stands. 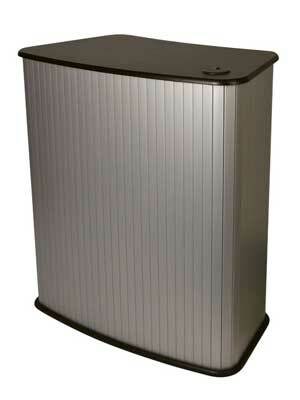 The Vector Lite C6 Counter is a smart modern take on standard rectangle counter. A flat front with convex bevelled sides creates a sweeping graphic front. 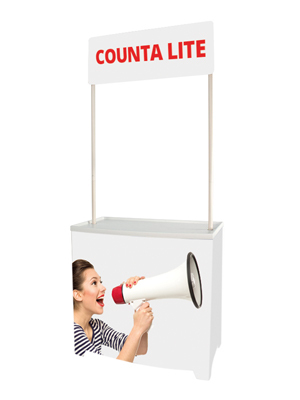 Counta Lite is the ultimate cost-effective demonstrator unit that is lightweight, portable and simple to assemble. 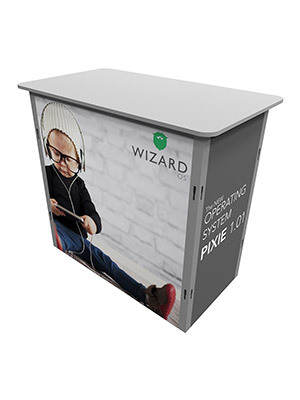 Print directly onto the plastic wrap base that forms the structure of the unit, and take advantage of the integrated base shelf for hiding away spare stock until it is ready to be displayed.